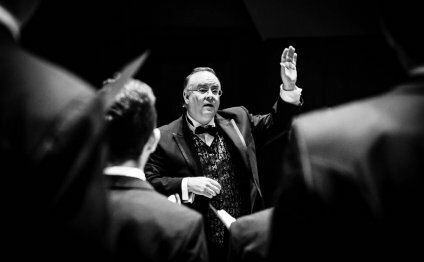 Setting the standard for choral excellence for 94 years, the Westminster Choir is composed of students at Westminster Choir College, a division of Rider University’s Westminster College of the Arts. It has been the chorus-in-residence for the prestigious Spoleto Festival USA since 1977, performing both in concert and as the opera chorus. The Westminster Choir has made three recordings with Joe Miller. The most recent, The Heart’s Reflection: Music of Daniel Elder, was described by Classics Today as “first rate” and “highly recommended.” Their recording Noël, a collection of French Christmas music and sacred works, also features Westminster alumna Jennifer Larmore, the most recorded mezzo-soprano of our era, and organist Ken Cowan. It was the centerpiece of the PRI Radio broadcast Noël – A Christmas from Paris, hosted by Bill McGlaughlin. Praised by The New York Times for its “full-bodied, incisive singing, ” the Westminster Choir also forms the core of the Westminster Symphonic Choir, which has performed and recorded with the leading conductors and orchestras of our time. The Symphonic Choir’s 2015-2016 season includes performances with The Philadelphia Orchestra and Yannick Nézet-Séguin, the Berlin Philharmonic and Simon Rattle, the New York Philharmonic and Jane Glover, and the New Jersey Symphony Orchestra and Jacques Lacombe. Friday, January 8 7:30 p.m.
Sunday, January 10 7:30 p.m.
Wednesday, January 13 7:30 p.m.